The ancient city of Jiaohe, which lies about ten kilometers west of the small town of Turpan, is one of the most visually spectacular ruins of the old Silk Road. More than 1,500 years of history sits atop this 30-meter high plateau and because of this it has become one of Xinjiang’s most interesting archeological sites – certainly one that’s worth your time to visit. The entire city ruins run 1,700 meters in length and 300 meters at the widest point. During its peak, Jiaohe was home to about 5,000 residents and boasted a “main street”, several monasteries, and government offices. It’s incredibly well-preserved considering its age! In this traveler’s guide to Jiaohe Ancient City in Turpan, Xinjiang, I’d like to introduce you to what I love about this place, what’s worth seeing, and how to get there yourself. 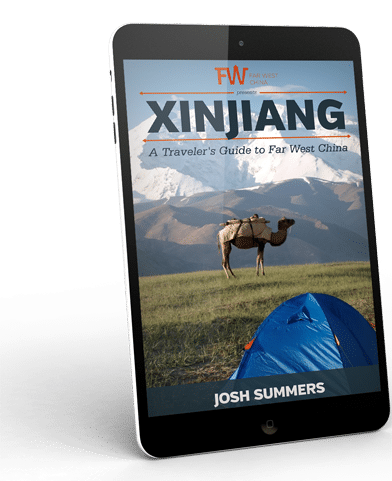 Keep in mind that this is one small portion of the most comprehensive travel guide book on the Xinjiang region that is published by FarWestChina. As you’re planning your trip, make sure to grab a copy of Xinjiang: A Traveler’s Guide to FarWestChina before anything else! Before you read through the history of Jiaohe along the Silk Road or soak in the travel tips I share based on multiple visits over the past 10 years, take a few minutes to watch this video where you can get a quick glimpse of the ancient city ruins. See more great Xinjiang videos on FarWestChina’s YouTube Channel! Although archeological finds indicate that the Cheshi people (in Chinese it’s 车师 but also known as the “Gushi”) had lived on this plateau as early as the second century B.C., the city of Jiaohe wasn’t formally established until the early Han Dynasty (4th century) when it became the capital of the Cheshi region and later a part of the Gaochang Kingdom. 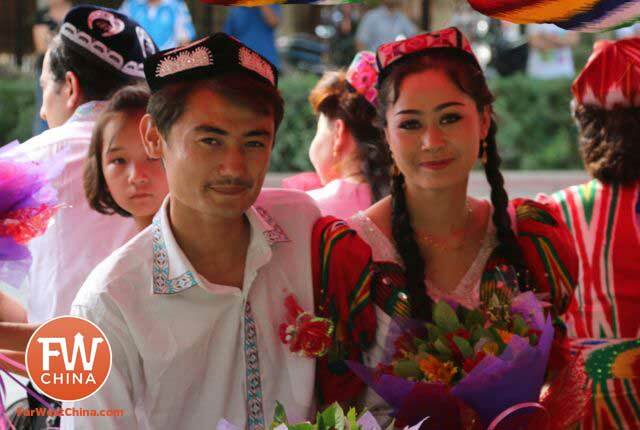 Fun Fact: The Cheshi (Gushi) people were a Caucasian race with light hair and blue eyes – nothing like the Han and Uyghur living in the area now. They’ve become most recently famous as some of the earliest growers of cannabis (marajuana)! The ruins you can walk through today are believed to only date back as far as the 7th century during which the Tang Dynasty made the city its county seat in 640 A.D. The government offices here ruled over a large portion of what is now Turpan county. Over time the city of Jiaohe deteriorated both in power and in beauty until it was rebuilt and occupied by the Uyghur in the middle of the 9th century. Buddhism, which was the religion of choice among Uyghur until Islam swept through a few centuries later, was a central part of life in Jiaohe, a part which you can clearly see among the monasteries and stupa grove. 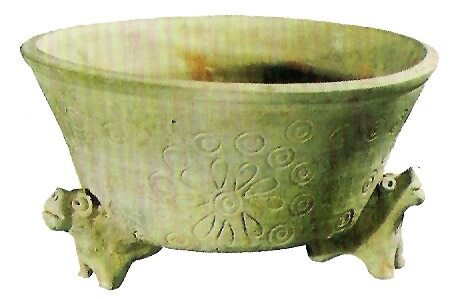 Most of the archeological treasures that have come from this city are now housed in both the Turpan Museum and the Xinjiang Museum in Urumqi. Because the most thorough excavations have been focused on the monasteries in the north of town, a good portion of the archeological finds are religious in nature. This is changing, however, as they continue to dig up the residential districts in the east of town. Examples of the former include painted silks, Buddhists statues and manuscripts while the latter consists mostly of pottery and tools. Although the ancient city of Jiaohe had multiple gates from which to enter and exit, nowadays the only entrance as on the southwest corner of the plateau where a ramp leads up into the city. It used to be that tourists could wander at will among the ruins but a more conscious effort to preserve Jiaohe means that it now has paved paths and cameras to make sure you stay on them. A wide, central street in Jiaohe runs north towards the Great Monastery and divides the city into an eastern and western half. Like any “main street”, this road was home to many of the workshops in town while the far eastern and western sides are all of the residential districts. All administrative and governmental offices were set up in the central part of the city a short distance from the many monasteries and Buddhist stupas that occupy the northern half of the city. Although walking the entire stretch of the city is a chore, it can be incredibly rewarding. If you’re up to the challenge, I believe there are four places of particular interest in the ancient city of Jiaohe. Stupa Grove: colored in blue on the map here, the great Stupa Grove is located at the northernmost part of the city and is home to 101 of Xinjiang’s earliest stupas dating from the 5th-7th centures. The Great Monastery: although there are multiple monasteries in Jiaohe, the Great Monastery (colored green) is the city’s largest. It’s also of particular interest because of the rock statues that are still visible in the central pillar of the main hall. Government Offices: colored in red here, the government offices are actually dug into the ground and not built up. Steps lead down to the courtyard where various caves make up the offices. Just north of the offices is a nice viewing platform where you can grab a panoramic view of the city. Residential District: the best place to get a sense of the residential district of Jiaohe is along the eastern ridge, colored in yellow on this map. Most of the houses here were carved out of the ground and still retain their shape. So now that you have all the background and layout of Turpan’s Jiaohe Ancient City, here’s everything you need to know about getting out there. First things first, you need to get to China’s western region of Xinjiang, which is a chore in and of itself. More than likely, this means either landing at the Urumqi international airport or taking a long train to the Urumqi train station. From there, it’s a simple high speed train from Urumqi to Turpan that will take just less than an hour. Once in Turpan, I personally recommend just hiring a taxi to take you out to Jiaohe (approx 30RMB each direction). That said, it’s entirely possible to either rent a bike and ride there or take public transportation. For the latter, just get on City Bus 101 headed west on LaoCheng Lu (老城路) near the Uyghur market. Get off at the Ya’er Xiang village stop (亚尔乡) which is the last stop for the 101. Here you can either find a minibus (2RMB/person), a 3-wheeled motorcycle cart (3RMB/person) or grab a taxi the rest of the way (approx. 15RMB total). Entrance to the city costs 70RMB/person with children under 2 being free. If you really want to enjoy the Jiaohe Ancient city in Turpan, here are a few tips that will be helpful during your time there. Get There Really Early…or Really Late: Tour buses tend to arrive between 10am-11am with loads of Chinese tourist. I recommend arriving either right when they open at 9:30am Beijing time or stay late into the evening as the sun is beginning to set. Not only do you avoid the tourists, you also avoid the heat. Bring Water: Speaking of heat, make sure you bring plenty of water! Especially during the summer when temperatures get well into the 100’s, you won’t regret having a couple liters of water handy. They sell water at the site, but it’s way too expensive. Hike Around: If you’re really adventurous, hike around the area a bit. There are hills to the southwest that are difficult to get to but provide some nice panoramic views of the city. As is the case with most tourist sites, the further away you get from the beaten path, the more secluded (and in my opinion beautiful) it gets. In my opinion, the Jiaohe Ancient City ruins is one of the few “must-see” sites when you travel to Turpan, Xinjiang, so make sure you stop by while you’re here! If you’re planning to travel to Turpan, check out the Turpan chapter of the best-selling Xinjiang: A Traveler’s Guide to FarWestChina. It lists the best hostels, places to eat and of course, the best places to visit. 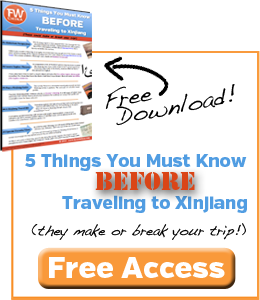 You can read the reviews for yourself – I guarantee it will be the most useful resource for your trip to Xinjiang! First and foremost, I welcome and encourage your creating these guides. I can appreciate the amount of research and editing that lies behind. My comments, with my usual tongue in cheek humor. Now seriously, these 17 football fields are just meaningless to non-American readers. It is also strange to use different units for length and width, respectively. Why don’t you go metric all the way ? Laurent, as always, I’m grateful for your comments and kind words! You’re absolutely right…I’ve edited the “football fields” out of the text, although at this point it’s too late for the video ;) Oh well. You’re also the second person who has corrected me on the “to” and “too”…my readers are far too grammatically sensitive for my own good! Ha! Again, thanks Laurent and never hesitate to call me out on stuff like this. 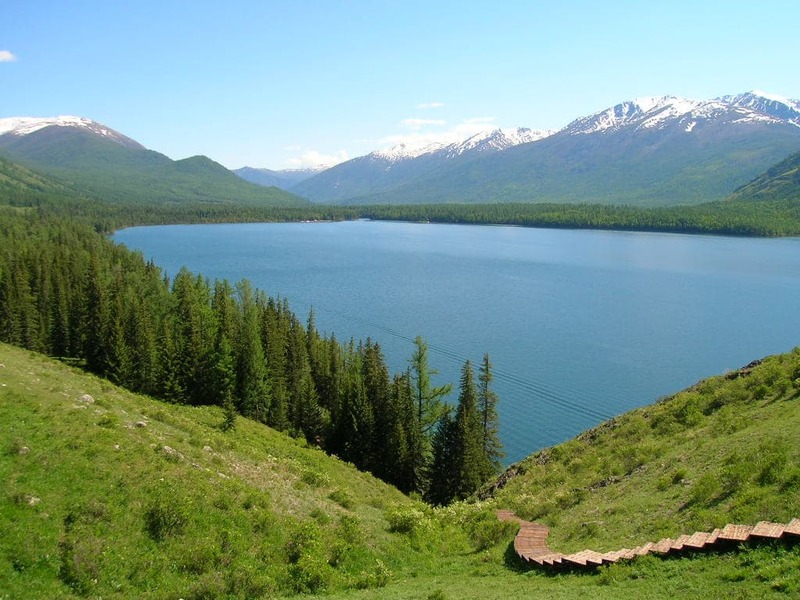 Possible to visit Kanas Lake in Jan? Anywhere i can find a bus timetable within Xinjiang (english) ? As I will be traveling alone.Is it ok to hire a taxi to someplaces in Xingjiang? Thank you in advance for you help! !